Witnessing a car accident first-hand requires a calm, cool, and collected response under traumatic circumstances. Your course of action will largely depend on the severity of the crash and the extent of the injuries, but there are some general guidelines to keep in mind. By following these tips, you'll be better prepared to help your fellow drivers until the professional emergency responders arrive. If you are driving when you spot a car crash, pull over to the side of the road at least 100 feet from the scene and put on your hazard lights. You want to give enough distance, so you don't put yourself in danger of broken glass, leaked fuel, or flames. Never assume that someone else already called 911. Even if the wreck doesn't appear severe, the authorities should be notified. Let the 911 operator know you witnessed a car accident, the location, some people involved, and any other pertinent details. Once you've ensured that it's safe to approach the scene, check on the condition of the crash victims to make sure they are okay and offer help if you are able. While this can be an emotionally taxing time, try to stick to the facts and remember that this is not the time to assess who is at fault for the accident or make judgments on what the other driver must have been thinking. A good rule of thumb is never to admit fault at the scene. Unless there's a risk of the vehicle catching fire, do not under any circumstances move an injured person. Despite your best intentions, you could accidentally make the injury worse. Let the trained medical professionals tend to the injuries, but you can provide comfort to reassuring victims that help is on the way. If the accident is minor, ask the driver to put the impacted vehicle in "park" and turn off the ignition. This will eliminate the risk of fire, especially since chances are good that the crash has caused an oil, fuel or coolant leak. If it's safe to do so, enlist help to move the car out of further harm's way and to leave space for other vehicles and emergency responders. If that's not possible, set up flares or traffic triangles to warn other drivers of the accident. When the police arrive, provide the relevant facts and your contact information. In the days and weeks following the event, you may be contacted as a witness by legal and medical authorities and insurance claims agents. Be honest, factual, and consistent with your statements. 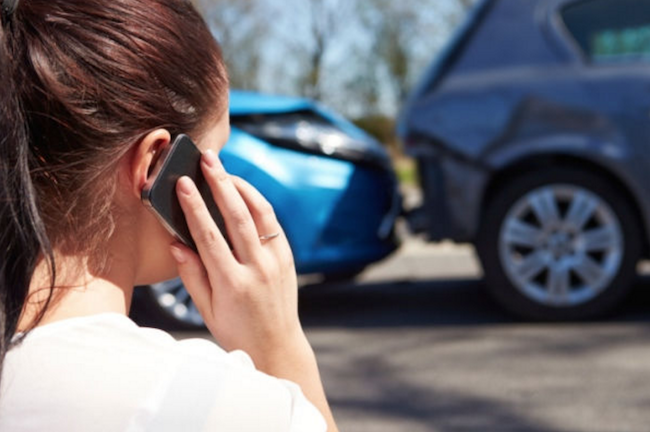 Car accidents can be upsetting for the victim and the bystander alike. The best way to deal with an accident is to stay on the scene and report what you've seen. Only exit your vehicle to render aid if it is safe to do so. Your clear-headed actions to safely assist or protect the victims until emergency assistance arrives can make an enormous difference in the overall outcome. Did you know? Being in an accident might be stressful, but GEICO Mobile makes the claims process easy. If the drivers are GEICO customers, encourage them to use the Mobile App. The interactive Accident Guide allows you to have your ID card ready, collect contact information, record the accident location and details, take photos, and report the claim. And once the claim is reported, you'll have easy access to update appointments and view claim details. Available in the App Store or Google Play.